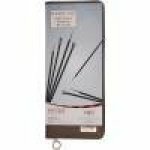 Knitting Needles > Karbonz Single Point Needle Set 10"
Knitter's Pride-Karbonz Straight Needle Set. The ideal set for completing all your knitting projects! 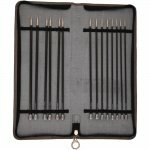 This package contains seven pairs of metal needles in sizes 4/3.5mm, 5/3.75mm, 6/4mm, 7/4.5mm, 8/5mm, 9/5.5mm and 10/6mm within one 13-1/4x5-3/4x1 inch grey faux leather case. Imported.